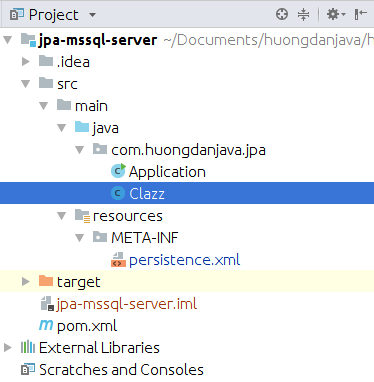 In the examples of Huong Dan Java on JPA, I often use MySQL as an example because it is free and easy to use, mainly because I’m familiar with it: D. I think some of you, especially the students, often use MSSQL Server. So, I write this tutorial to guide you all how to connect MSSQL Server in JPA. To use JPA with MSSQL Server, we need to add the JDBC Driver dependency for MSSQL Server as mssql-jdbc. You can find the latest version of mssql-jdbc from Microsoft on the Remote Maven Repository at https://mvnrepository.com/artifact/com.microsoft.sqlserver/mssql-jdbc. This JDBC Driver is available in many versions for different versions of Java, please select the correct version of Java that you are using. The port is the port that MSSQL Server runs on this server. The default port of MSSQL is 1443. If you change the port then correct it. database_name is the name of the database that we need to work on.